Bedliners & Equipment Coatings – Specialty Products, Inc.
Providing years of superior protection, SPI offers the toughest spray applied coatings available to protect your truck bed, trailer, heavy duty equipment and more. Full Metal Jacket™ Plus bed liner polyurea is trusted by thousands of customers for their new and used vehicles. Environmentally friendly and virtually maintenance free, our polyurea outperforms hybrids and polyurethane blends. FMJ™ Plus is a durable coating that creates a seamless barrier to prevent rust and corrosion, and protects against normal wear and tear, abrasion, impact and chemical exposure. FMJ™ Plus will not chip, crack, warp, peel or tear. It can be applied to any thickness to create a shock absorbing liner that dampens vibration and sound, and protects your precious cargo. 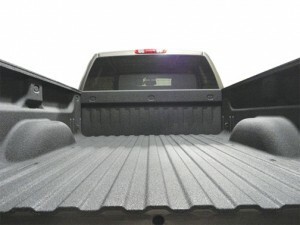 FMJ™ Plus can provide a non-slip textured finish that helps keep cargo in place, while protecting your truck from cargo damage. It will follow the exact contour of your truck bed, and will not affect your payload capacity or interfere with installation of accessories, such as 5th wheel hitches, utility boxes or tonneau covers. FMJ™ Plus is more than a bed liner material; it can be used on commercial vehicles, tanks, boats, utility trailers, farm equipment, buses, and SUV interiors. It is also suitable for protecting roll bars, ski racks, running boards, stairs, ramps, roofs, ladder racks, rocker panels, front end bras, speaker boxes and much more. Since you will only have your truck sprayed once, go with the industry’s first true Transferable Lifetime Wear Warranty, and make sure it’s sprayed right with SPI’s Full Metal Jacket™. We have hundreds of experienced FMJ™ Plus applicators and shops conveniently located around the world.